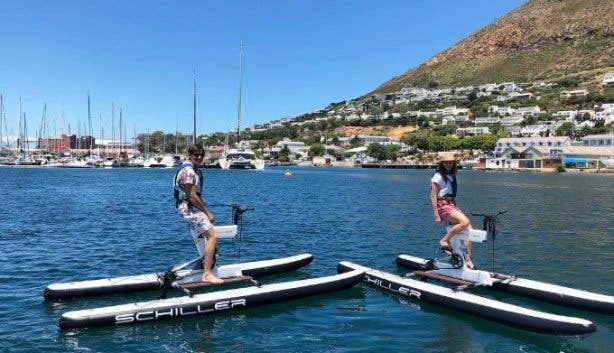 Cape Town Water Bikes is a new way to experience the Simon’s Town coast. Hop on one of the world’s most advanced water bikes and get pedalling for a different perspective. 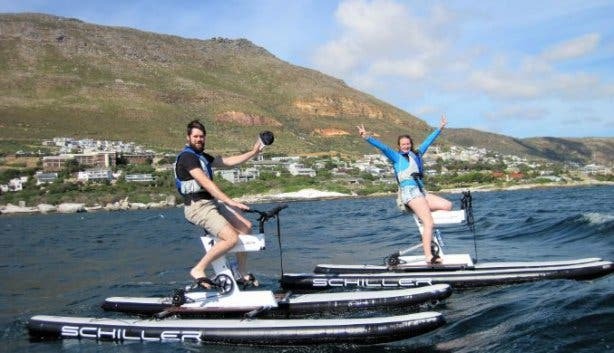 Ros Potgieter has been doing boat charters from Simon’s Town for the past 12 years, so she saw an opportunity for a new water activity. 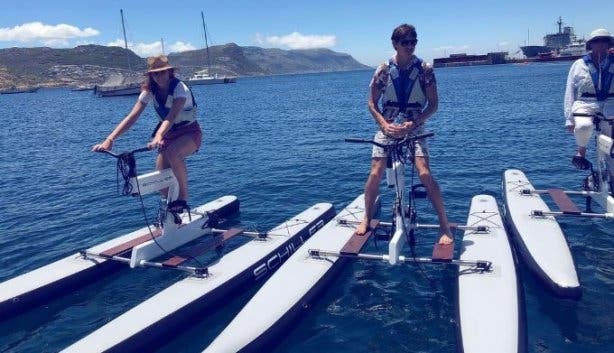 She founded Cape Town Water Bikes in mid-December 2018 as a unique concept that was not yet available anywhere in South Africa. The bikes are well-suited to the sea conditions in Simon’s Town because they are non-motorised. 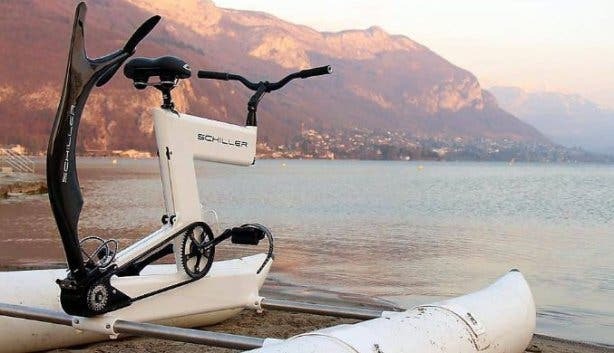 Can you imagine the bay and mountain views as you experience the marine environment perched high up on the seat of a water bike? You might see whales, dolphins, seals, our famous African penguin colony, other water birds and maybe even a turtle. 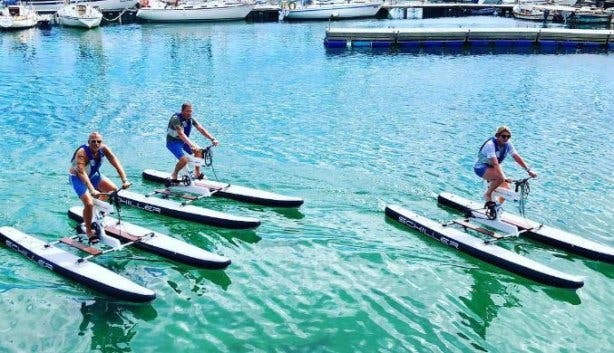 The precision-engineered water bikes don’t produce any noise, so marine life isn’t scared off. The bikes do not emit any emissions, do not require fuel and allow you to safely explore without an environmental footprint. Being so high off the water, gives you a new perspective of your surroundings, which is very different from other water vessels. 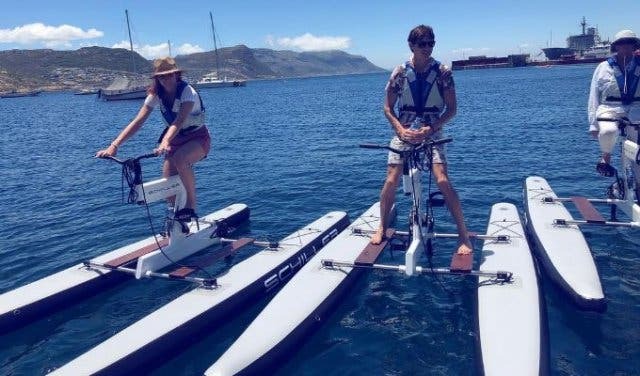 The bikes are stable, thanks to the pontoons on either side of the bike. 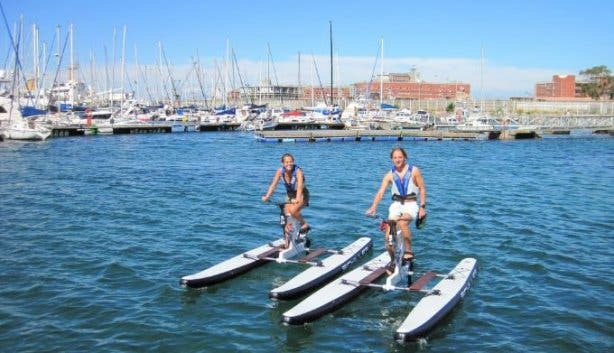 They are easy to steer and do not require the same balance as with regular bicycles. You don’t need any experience or skills; you just need to be tall enough to reach the pedals (1.5m tall). Because there can be four seasons in one day in Cape Town, it’s best to bring a lightweight but warm jacket that can get wet. Lockers are available to keep your possessions safe. 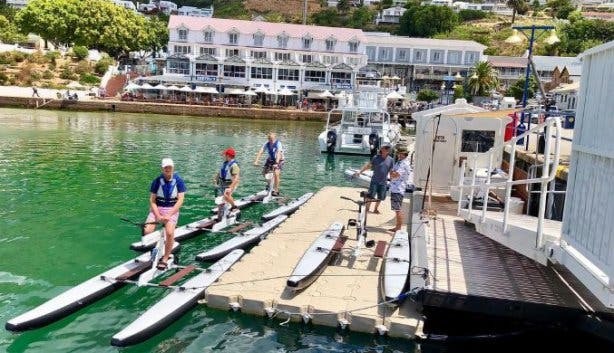 Departing from Simon's Town pier, two options for guided tours are available depending on the weather and water. 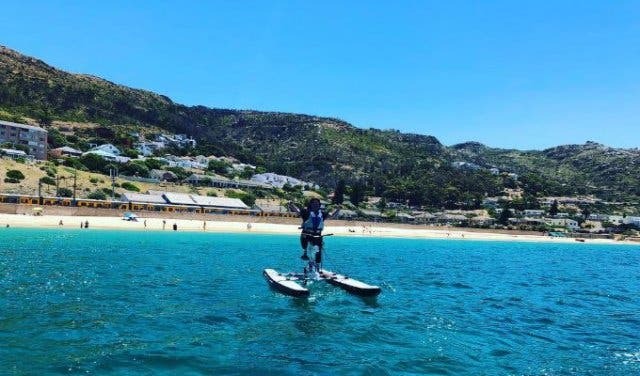 Either head up towards the African penguin colony at Boulders Beach, or meander along the coastline past Long Beach to the Clan Stuart Shipwreck and continue up the picturesque coastline before turning back towards the naval base. Tours cost R590 and last for two hours (there are two different time slots to choose from daily), and include a safety radio, buoyancy aid and bottled water. Tours are accompanied by a safety boat. You can book your tour online. 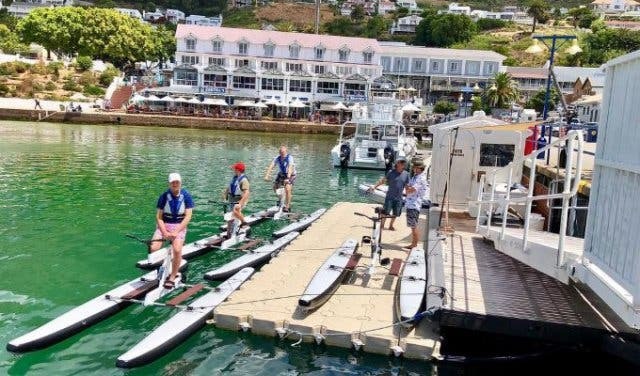 Walk-in rentals are available from the Simon’s Town pier. Prices start at R290 and you can choose 30 minutes or one hour. 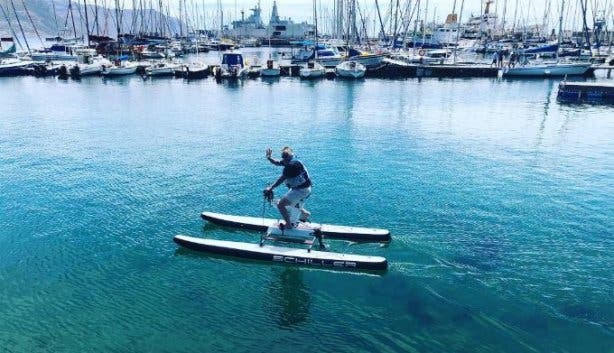 See what else there is to do in Simon’s Town. 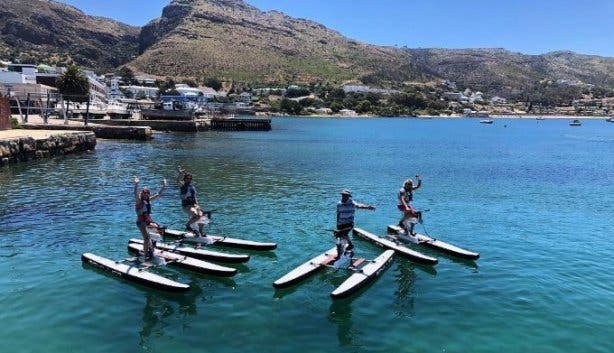 Cape Town offers many fun things for kids to do. Water babies, check out all sorts of water activities. 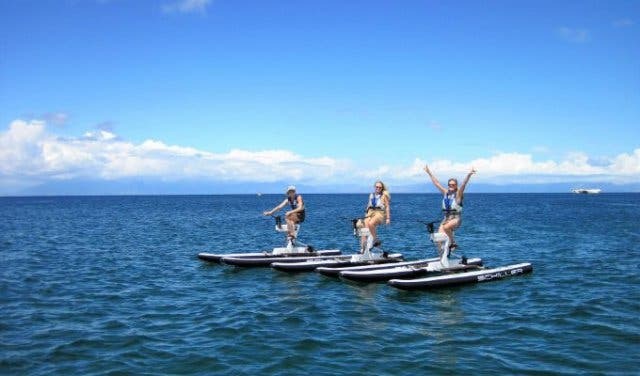 For an exhilarating experience, try out stand up paddling and surfing. A great workout that the adventurous should try is kayaking. There is so much to see and do in our waters so check out various ocean experiences. 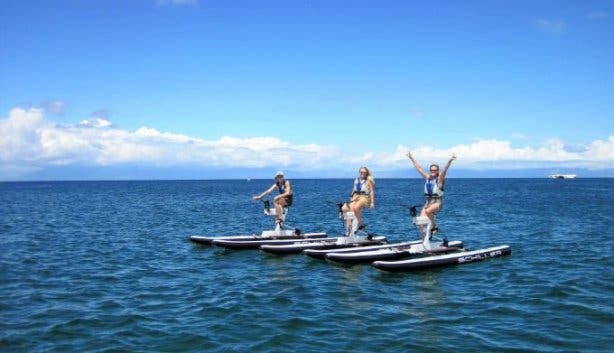 If you hate the gym, but love keeping fit, there are many fun ways to keep fit. If cycling on dry ground is more of your thing, check out local cycling routes.